The album Herb Alpert Presents Sergio Mendes & Brasil '66 gave Mendes his first hit song, "Mas Que Nada," and his big break. For more than five decades, Brazilian pianist, composer and bandleader Sergio Mendes has been charming audiences around the world with his signature mix of pop, jazz and bossa nova. Mendes is out now with a new album of collaborations called Magic, and he stopped by NPR West to tell All Things Considered about his early career breakthroughs. Mendes says much of his success has come through a lifetime of serendipitous meetings. "I call it the magic of the encounter," he says: "the magic of encountering people that helped me, that support me. My life has been very much a succession of those moments. ... I feel very humble about that." Mendes was born in the Brazilian city of Niterói, where his love for music began with classical piano. But when Mendes was around 12 years old, a childhood friend first introduced him to a Dave Brubeck jazz record, and the song "Take Five." "For me that was like, I would say, one of the incredible moments of my life," Mendes remembers. "Because when I heard that, I had no idea about jazz or anything. So the whole world of jazz for me was like, 'Wow, what is that?' "
Mendes says he was drawn away from classical music by the "freedom of improvisation" in jazz. "I love to try new things," he says. "The idea that you could improvise and you have under it fantastic harmonies, chords — I mean, for me, that was magical." Mendes went from playing Chopin, Mozart and Beethoven to Brubeck, Getz and Gillespie. At the same time, American jazz musicians were discovering Brazilian rhythms and creating a wave of interest in bossa nova. By the time he was a teenager, Mendes was playing piano in jazz clubs in Brazil, and learning to play songs written by other Brazilian musicians, like Antônio Carlos Jobim. Mendes came to the United States in 1962, where he joined other Brazilian and American musicians Carnegie Hall for a celebration of bossa nova. He liked what he saw. In 1964, Mendes says, he came to the United States for good, landing in Los Angeles along with members of his band from Brazil. At first, the going was not easy. His Brazilian bandmates returned home, forcing Mendes to form a new group. Mendes got to know Tom and Geordie Hormel, who owned a recording studio and loved Brazilian music. They allowed Mendes to record and audition in front of record companies, but most of those auditions went nowhere. "We'd play three, four, five songs" for record producers, Mendes says, but, at first, those auditions were dead-ends. "No answer, nothing," Mendes says, "just, 'Oh, thank you. You guys sounds great, bye.' "
Then one day, Mendes remembers, two "good-looking young guys" walked into the studio to hear his band, now called Brasil '66. The two men were Herb Alpert, known for his group The Tijuana Brass, and Jerry Moss. Together, they founded the record label A&M. After performing a few songs, Mendes spoke to Alpert. "He said to me, 'I really like your sound, I would like to sign you with our record company,'" Mendes recalls. "It was like, 'Wow, really? Great. Here we go!' "
Together they created the album Herb Alpert Presents Sergio Mendes and Brasil '66. The album's first track was "Mas Que Nada," a song written by Brazilian musician Jorge Ben, which Mendes learned while performing in Brazil. The arrangement from Mendes and the performance by Brasil '66 sent the song climbing up the Billboard charts. "It was the first time that a song in Portuguese was a hit in America and all over the world," says Mendes. He was no longer a struggling musician. He upgraded from his one-bedroom apartment in Glendale, Calif., to a three-bedroom apartment in Laurel Canyon, and he bought his first car, a gray 1966 Pontiac LeMans. Nearly five decades later, Mendes still credits the song with transforming his career, and his life. "That's the song that gave me my first big break," Mendes says. "I still love playing it. I never got tired of it." The Brazilian composer and bandleader Sergio Mendes has a new album of collaborations out this week. It's called "Magic." JOHN LEGEND: (Singing) I see the wonder in your eyes. Let the rhythm hypnotize. Let it say your mind away. RATH: That's a song with John Legend called "Don't Say Goodbye." Sergio Mendes stopped by our studios here at NPR West to talk about his early career as part of our series "My Big Break." SERGIO MENDES: I call it the magic of encounter - the magic of encountering people that helped me, that support me. My life has been very much a succession of those moments. And I feel very good and very humble about that. MENDES: I was born in a city called Niteroi, which is across the bay from Rio de Janeiro, Brazil. My childhood was on the beach like a lot of other kids, playing soccer. And I started learning classical music - Chopin, Beethoven, Mozart. And I had a wonderful teacher. MENDES: ...For the first time I heard a jazz record. MENDES: A friend of mine had the Dave Brubeck record. And I remember there was a song - "Take Five." MENDES: For me that was like, I would say, one of the incredible moments of my life. Because when I heard that, I had no idea about jazz or anything. So the whole world of jazz for me was like - wow, what is that? MENDES: The freedom of improvisation - I'm very curious and I love to try new things. So the idea that you could improvise and you have under it fantastic harmonies, chords. I mean, for me that was magical. MENDES: Now I'm already like 17, 18 and playing in nightclubs in Rio de Janeiro. Those are the days of the bossa Nova now. MENDES: So in 1962 - November - they had a bossa nova concert at Carnegie Hall. I brought my band. We played at Carnegie Hall. It was Joao Gilberto, Jobim, Stan Getz, Dizzy Gillespie - a lot of my idols. And for me at 19 or 20 years old, to come to America was like wow. MENDES: So after Carnegie Hall, I went back to Brazil then finally decided to come to America again in 1964 - came to Los Angeles. I had a friend of mine. His name was Tom Hormel and Geordie Hormel. And they loved Brazilian music. And he said Sergio can use our place to rehearse - whatever you want to do. People from record companies, they used to come to Hormel's studio to hear us. MENDES: So we'd play three, four, five songs. And a lot of record companies came in. No answer, nothing, you know, just oh, thank you. You guys sound great. Bye. So we kept rehearsing and rehearsing and rehearsing. MENDES: So one day walk in a couple of guys. And they were Jerry Moss and Herb Alpert - A&M. And they introduced themselves. And they heard a couple of songs. And they said to me - said I really like your sound. I'd like to sign you with our record company. And I said wow, really? You know, great. Here we go. 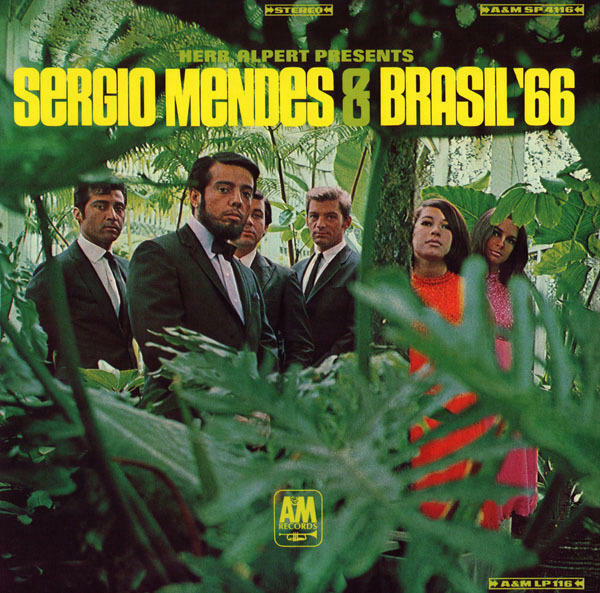 MENDES: We did the first record, you know, "Herb Alpert Presents Sergio Mendes and Brasil '66." The song "Mas Que Nada" went to the top of the charts. It was the first time that the song in Portuguese was a hit in America and all over the world. MENDES: Then I brought my first car - a Pontiac LeMans. Remember that - 1966, gray. MENDES: That's the song that gave me my first big break. And I still love playing it. I never got tired of it. RATH: The new album from Sergio Mendes is called "Magic." And we want to hear about your big break even if you haven't played Carnegie Hall. Send us an email at mybigbreak@npr.org. (SOUNDBITE OF SONG, "MAS QUE NADA") Transcript provided by NPR, Copyright NPR.